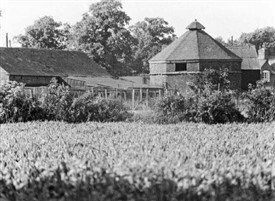 The dovecote at Barton-in-Fabis stands in the yard of Manor Farm and is a very attractive and historic listed building. It is octagonal and built of small red bricks which stand on a few feet of stone above the ground. It is sixteen feet high to the top of the walls, and there are two stringcourses, one about twelve feet up, the other just below the roof. The cote is 82 feet in circumference, and the walls are 2ft 6ins thick. The nesting places are formed of plaster, and number 1200. Entry for the birds is gained at the top, and there was a cord to close it up when pigeons were to be caught. Writing in 1910, E.L. Guilford* remarked "The old dovecote belonging to the manor house of the Sacheverells is fast tumbling into ruin and requires immediate attention if it is to be saved." On the south side of the dovecote there was formerly a coat of arms, probably of the Sacheverell family, and whilst it was being restored in 1980 the interior of one nesting box revealed the inscription '1677 W.S.' - presumably a reference to William Sacheverell who originally caused the cote to be built.